Last weekend, the town of Stockbridge, Massachusetts outfitted its downtown in the style of its most celebrated long-term resident, Norman Rockwell. 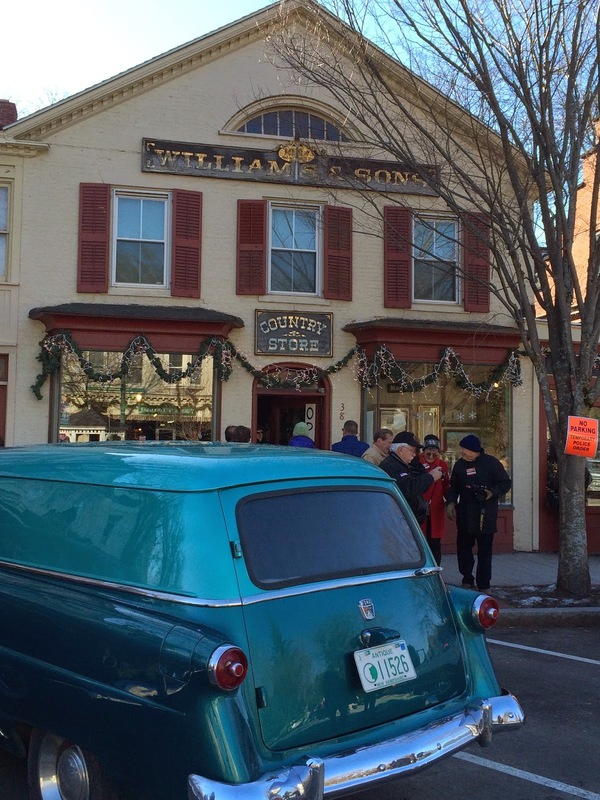 Main Street at Christmas is a recreation of Rockwell's iconic painting of a quaint New England village at the Christmas holiday. The weekend's activities were sponsored by the local Chamber of Commerce and Saturday's rain did not deter visitors to the Norman Rockwell Museum or to the sold-out holiday concert on Saturday night. We started our weekend in Stockbridge with a trip to a local coffeehouse and then went to explore the Norman Rockwell Museum, home of the world's largest collection of Rockwell art, including 323 Saturday Evening Post covers. After our morning of culture, we ventured out to Great Barrington for lunch at a solar-powered brewery to continue my husband's quest of the perfect beer. The wood stove was the perfect remedy for the cold December rain. Then, after a bit of shopping at the nearby outlet mall, we found another bakery for the best baklava I have ever had. 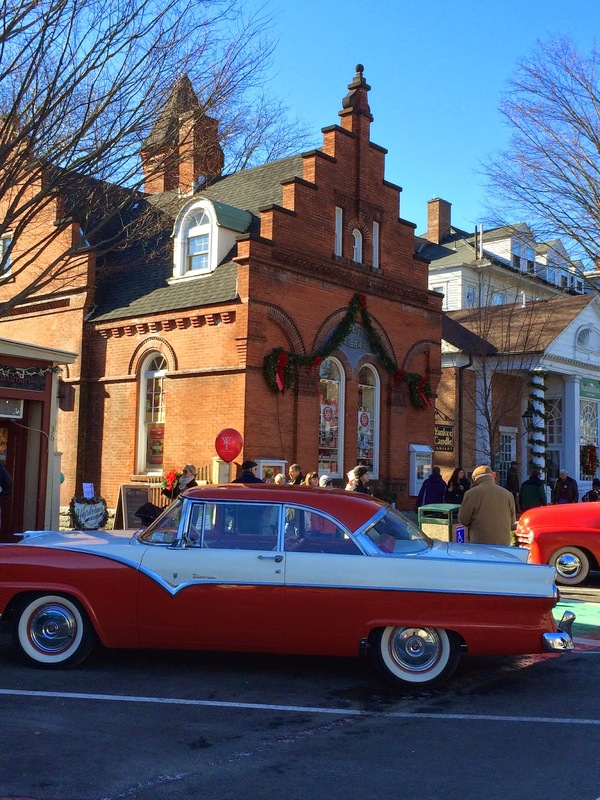 The weekend culminated with a recreation of Rockwell's painting, Main Street at Christmas. 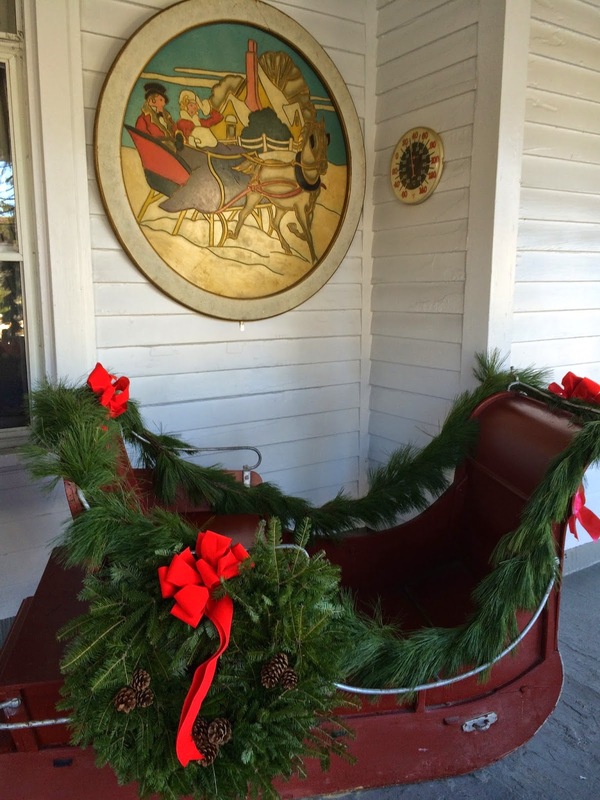 Lined with vintage cars and shops offering their finest, Main Street came to life with carolers at the historic Red Lion Inn, a colorful jester, horse-drawn wagon rides, and throngs of merry-makers awaiting Santa's arrival on a vintage fire engine. What a relief that the rain of the day before had moved out and been replaced with a bright blue sky. 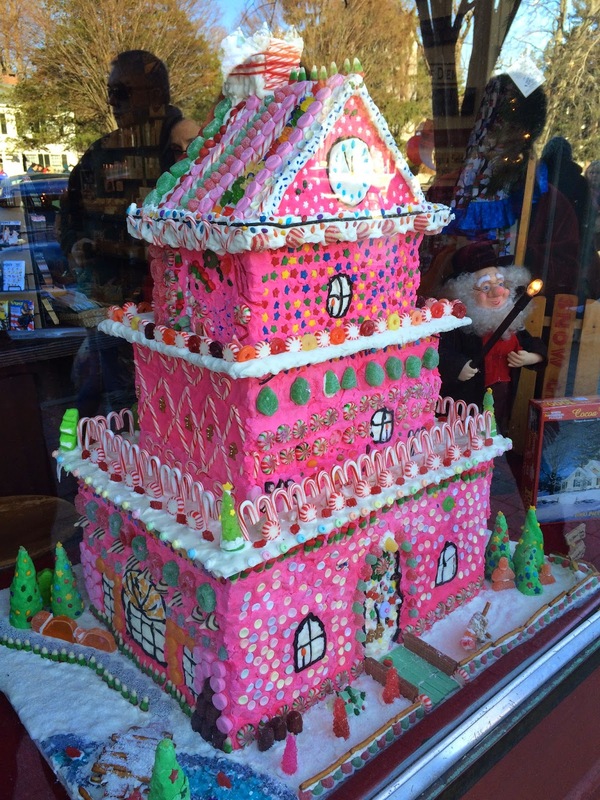 The Berkshires are a year-round destination and this Christmas celebration did not disappoint. 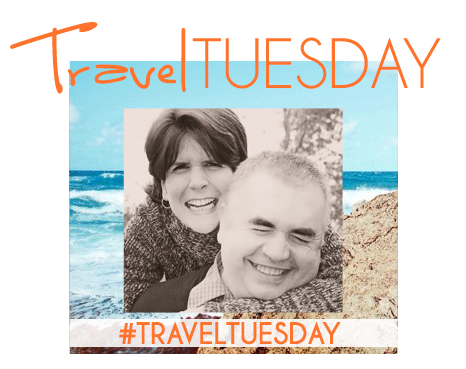 With events planned for the whole family, this destination event is a crowd-pleaser. Book early, especially if you plan to stay at the iconic Red Lion Inn. If you're local, have you ever attended this event? If not, does your area host a similar nostalgic holiday weekend? Feed our wanderlust for next year. My family and I go to Stockbridge every year for shopping at Lee and then a late lunch/dinner at The Red Lion Inn. Nothing is more "Christmas" then that town in the winter season! We truly love it and I love the way you highlighted it here. Thank you! We had a great time. We were able to sneak in some shopping in Lee too. Going to the Rockwell Museum really pulled it all together. Thank you so much for stopping by! So glad you shared this! Loved seeing those sweet little shops! Thank you, Tamyra. It's a great place to visit. That is so cool! What a fun weekend! Thanks, Rebecca! We had a great time. How awesome is this? I felt like I took a giant leap back in time. This was fantastic! The vintage cars were great and it was like stepping back in time. Thank you so much for stopping by, Mary. Looks like a great time! So pretty. I love Norman Rockwell's paintings and it's neat that they recreate this one at Christmas. Rockwell's art is fun. I love the Post covers...like a time capsule. This was a fun weekend overall...a real destination weekend. Thank you for stopping by, Hilda. This is soooo nostalgic! I had no idea there was a Norman Rockwell museum. Looks so cozy and fun. Rockwell's art is fun and the museum is a real gem. I love the Post covers...like a time capsule. This was a fun weekend overall...a real destination weekend. Thank you for stopping by, Lisa. MA is such a great place to be! Agreed, Annette. There is something for everyone, for sure. Thank you for stopping by! I bet I would have loved this! We had our town's annual Winter Walk last weekend, which was surprisingly nice and well-attended as well, despite the freezing rain. And the Red Lion Inn! I ate there with friends last month and it's so cozy and storybook-like. The Red Lion is a gem. This weekend was full of nostalgia and Christmas fun. I'm so glad we went. I have never attended but that looks so lovely! I love his piece of advice. The vintage cars and all the shops just look so nostalgic. I am so glad we went. It's been on my radar for a while. The Berkshires also has great food and artisans....a weekend destination for sure. I love all of your photos! I enjoyed following on Instagram too! Thank you! We had a great time. I will give him that tip..thanks so much! We had a great time. Welcome, Yelle. We had a great weekend. How fun that you work in a museum. What kind of art?Thank you so much for stopping by! Wow what great pics! I love the be nice or leave note lol. Looks like you had an amazing time! Thank you, Carolann. We had a great weekend. It's a destination event for sure. Thank you, Lauren. I must have just forgotten...it's on the others. Thanks.